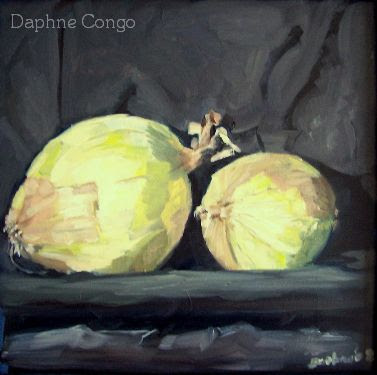 These onions I did on Monday before my Adults Oil Painting class, Simple Beauty in Everyday Life, that I instruct. I had my students paint on a dark ground and so it inspired me to do the same. With the main focus being tone. These onions I set under dramatic lighting. It really got me interested in cloth. I think I need to work more with cloth. I find that one painting often, actually almost always, leads me into the next painting. It really influences where I will go next. I have to thank my sister for bringing over really good tunes to paint to. I love painting to music. It is hard to paint without other distractions like music. I let my left brain get distracted by the music so my right brain can focus on painting. When I get to the point where I cannot hear the music anymore, even though it is still playing, then I know I am "in the zone". Nothing but good things come out when I am " in the zone".